Dolce Gusto ® compatible capsulesThere are 33 products. Dolce Gusto ® is the modern brand of the espresso world. Dolce Gusto ® coffeemakers with their 15 bars of pressure allow a perfect extraction of aromas leading to a perfect cup. In this selection of Dolce Gusto ® compatible capsules you will also find a wide selection of teas, flavored coffees. Latte Macchiato Café Royal compatible Dolce Gusto ® capsules. Discover this recipe where milk smoothness blends perfectly with the power of espresso. The whole is accompanied by a delicate milk froth.A box contains 8 capsules of espresso and 8 capsules of milk. Classico Capsules compatible with Dolce Gusto ®. Classico, compatible with Dolce Gusto ®. Classico is a sweet and delicate espresso from a sumptuous blend of robusta and arabica from Central America and Brazil. 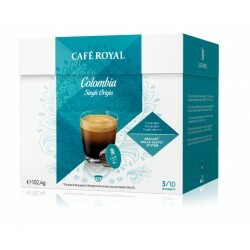 Columbia Café Royal compatible Dolce Gusto ® capsules. Colombia is an espresso with a slight fruity bitterness, it is 100% arabica and has only one origin which is Colombia. In cup this coffee is very balanced and its intensity is 3/10. 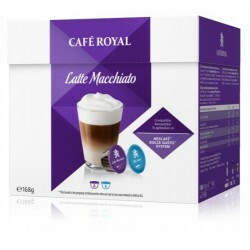 Cappuccino capsules of the Café Royal brand compatible with Dolce Gusto ® coffee makers. Cappuccino is a powerful espresso for Dolce Gusto accompanied by an exquisite milk froth to respect the delicious Italian tradition.A box consists of 8 capsules of coffee + 8 capsules of milk. Capsules Forte Dolce Gusto ® compatible. 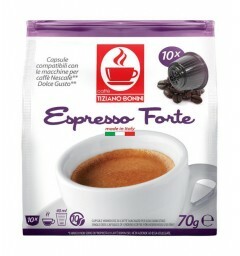 Capsules Forte Dolce Gusto ® compatible.Caffè Bonini has developed the Forte coffee capsules for lovers of powerful and full-bodied coffee. A delicate mousse brings the gourmet touch to this espresso. 10 Seta coffee capsules compatible with Dolce Gusto ® brand Caffè Bonini.The Seta coffee capsules are extremely rich in flavors. A 100% Arabica, sweet with floral notes. At the end of the mouth, this drink will reveal a cocoa note.